Join the Swarthmore College dance program faculty for an evening of choreographic works on Saturday, February 9th at 8PM in the LPAC Pearson-Hall Theatre. Selections include modern, flamenco, African, and much more with works for the dance faculty including Kemal Nance, Jumatatu Poe, Dolores Gmitter, Kim Arrow, Jon Sherman and visiting Cornell professor Kumudini Lakhia. This entry was posted in Dance and tagged Faculty Dance Concert on January 23, 2013 by twebb1. 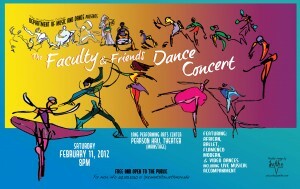 This entry was posted in Dance and tagged Faculty Dance Concert on February 29, 2012 by twebb1.